A few weeks ago my father celebrated a decadal birthday and as part of a present I did a portrait picture of each guest. I needed to generate some small hard copies of the collected portraits, i.e. 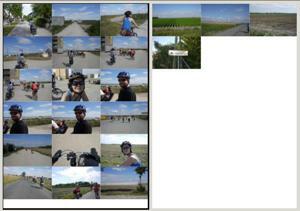 I needed to generate something like a contact sheet from a bunch (49) of pictures. Doing this by hand of course violates the First Rule of Perl Club ("Laziness"), so I hacked up a quick script, which I cleaned up a bit and hereby present to you, dear Internet. I'm using PDF::Create because it provides a high enough layer of abstraction to the gruesome horror that is PDF. For such a small script I'm also too lazy to use any command line parsing modules and just fall back to good, old 90ies style @ARGV-munging. I initiate a new PDF::Create object using the A4 format (I could of course get the format from the command line, but than I'd definitely need to use some proper option parsing module. Besides, A4 is the only sane format for paper...). $pdf_page will be the template from which further pages will be created. Again using 90ies style, because I'm in the mood for retro programming, and using Path::Class or similar is a bit overkill for a 47-liner running on my machine... We skip all non-jpegs and call $pdf->image on the path. image does some PDF magic I don't care about (abstraction! ), but also returns a data structure containing the width and height of the image. Which we store for future reference. Next step: putting the images into the PDF. The most complex part of the script is figuring out where to put the images. It doesn't help that PDF defines 0/0 to be the bottom left corner of a page, and also uses the bottom left corner of an image to position it. So, to put an image right to the top of the page, we have to get the maximum page size from the data structure $pdf_format (which we got from $pdf->get_page_size earlier) and subtract the height of the image. Now we can loop through all the images and put them on the page. Should the xpos get to big, we start a new row (with $xpos =0 and $ypos -= $height). Should the next row start below the page bottom (i.e $ypos < 0), start a new page and again set $ypos to the top of the page.